A couple of weeks ago, we celebrated my dear friend Betty’s birthday. I love any excuse to make a cake, but a birthday is the best! I wanted to make a cake that was something that she liked, but was also unexpected. When prompted, she requested a London Fog – earl grey tea with vanilla – cake. Luckily, there was a recipe for earl grey buttercream in Tessa’s new book, Layered, so that was, well, a piece of cake. Mike’s answer was immediate: chips. And it’s absolutely true, Betty is a chip fiend. Betty’s been known to eat entire family size bags of chips, for dinner. She regularly goes on all chip diets where she actually manages to lose weight. And once, when she was feeling particularly down, I left a surprise care package at her door, full of – you got it – chips. Preheat the oven to 350°F. Lightly grease and line four 6-inch round cake pans and set aside. Sift the flour, baking powder and salt. Set aside. In the bowl of a stand mixer, with the paddle attachment, beat the butter on medium until smooth. Add the sugar and vanilla. Mix on medium-high until light and fluffy, 3-5 minutes. Stop and scrape down the bowl. 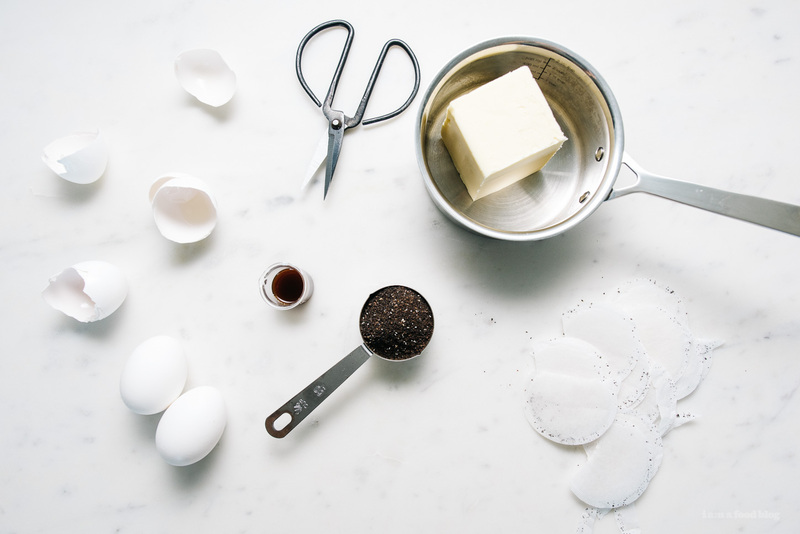 On medium-low, add the egg yolks one at a time, mixing well and scraping down the bowl after each addition. Turn the mixer to low and add int the flour in three batches, alternating with the milk – start with the flour so you end on flour. Mix for no more than 30 seconds after the last streaks of the dry mix are incorporated. Evenly divide the batter among the prepared pans. Bake for 22-25 minutes or until a toothpick inserted in the centre of the cake comes out clean. Let cool on a wire rack for 15 minutes before removing from the pan to cool completely. Note: I made a very tall 3 layer 5 inch cake, as well as a 2 layer 5 inch cake – my layers were just taller and smaller than Tessa’s. Place 1 cup of butter in a small saucepan with the loose tea. Heat over medium heat until the butter melts, then reduce to low and simmer for 5 minutes. Remove from the heat and let steep for 5 minutes. Strain through a fine mesh strainer and refrigerate until the consistency of soft butter, 20-30 minutes. 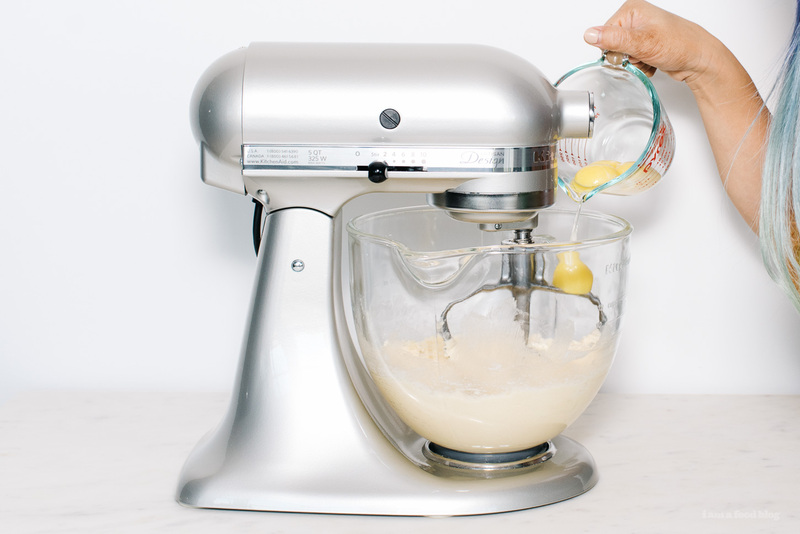 In the bowl of a stand mixer, whisk together the sugar and egg whites. Fill a medium saucepan with a couple inches of water and bring to a simmer over medium high heat. Place the glass bowl on top to create a double boiler situation. The bottom of the glass bowl should not be touching the water. Whisk intermittently, heating the egg-sugar mix until it is 160°F. Carefully wipe down the bowl and attach it too the stand mixer. With the whisk attachment, beat the egg whites on high for 8-10 minutes, until it holds medium-stiff peaks. The outside of the bowl should come to room temp and there should be no residual heat. Switch to the paddle, and with the mixer on low, add the vanilla. Add the butter (both kinds), a couple of tablespoons at a time until incorporated. 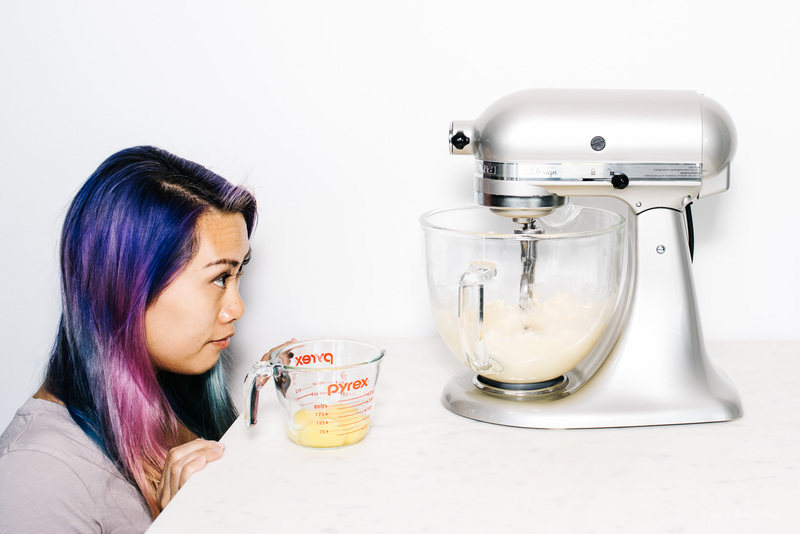 Turn the mixer to medium-high and beat until silky smooth, 3-5 minutes. 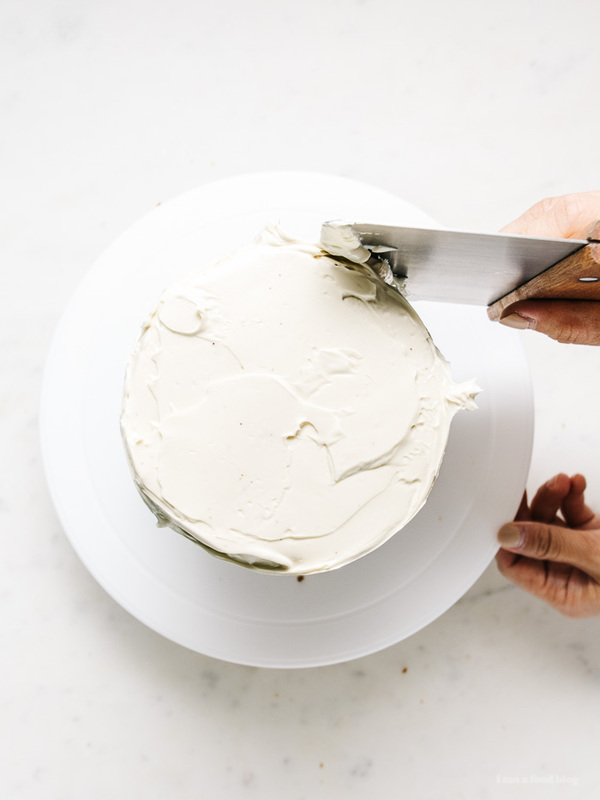 To frost the cake: check out this handy tutorial, complete with photos on Tessa’s site! Line a large baking sheet with parchment paper. Spread the chips out in an even layer and place in the oven. Set the oven for 250°F and leave the chips in while preparing the caramel. Mix the brown sugar, corn syrup, butter and salt in a heavy bottomed large skillet. Stir constantly and bring to a boil over medium heat. Continue to boil for 5 minutes without stirring. Remove from heat and carefully stir in the baking soda – it will form. Pour the syrup over the warm chips, stirring to coat evenly. Alternatively, put the chips into the skillet and toss. Bake the coated chips for 45 minutes, stirring occasionally. Remove from oven and let cool before enjoying! 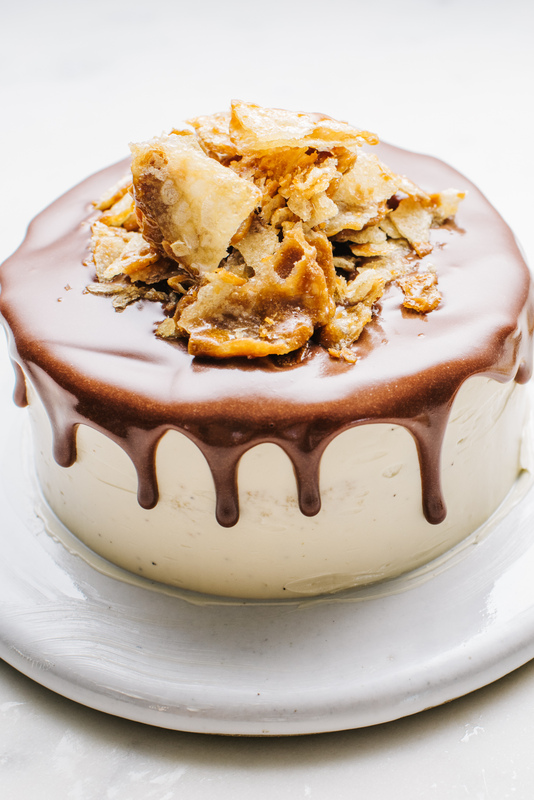 A London fog cake sounds like my kind of cake, and I love the addition of those caramelized chips. Gorgeous! !!!!!!!!!!!!!! this is the most amazing cake i’ve ever witnessed. 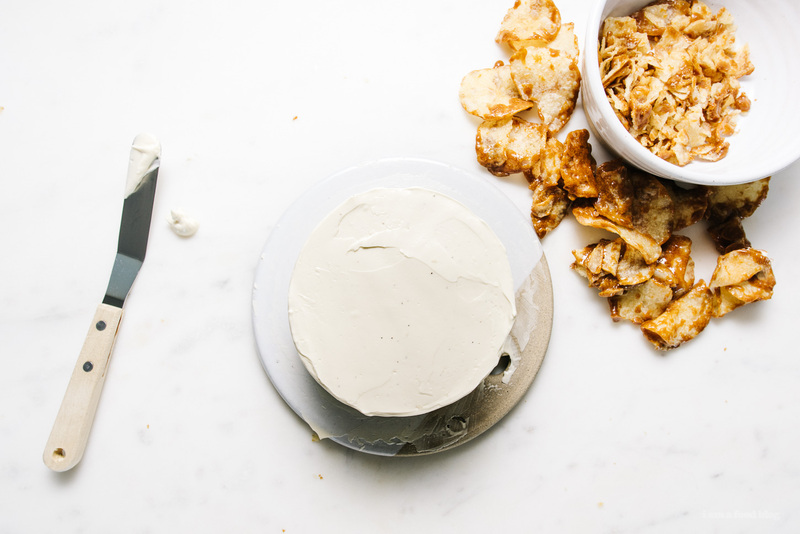 i love earl grey but sometimes its too much for me, so I love the idea of the london fog route plus pairing it with sweet + salty chips… so good. This is so awesome!! I love the caramelized potato chips. That’s so cool!! My name is Betty and I’m a chip-oholic. I just wanted to drop by and say THANK YOU STEPH!!!! The cake was so epic. SO BETTY. CARAMELIZED CHIPS FTW!!! holy pretty cake. and i’m totally eyeing that offset. it’s so cute!! also, so is your cutie pie face!!! These look so delicious! Any kind of cake is my guilty pleasure :) Thank you for sharing! Happy Birthday, Betty!! I’ve been wanting to make that cake for a while now. 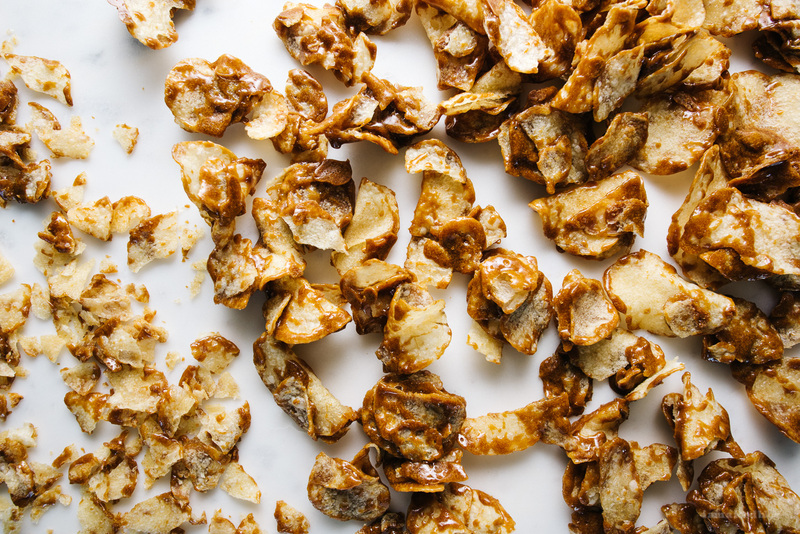 The caramelized potato chips was a genius move. Personal, and really tasty. Love it! So, just wanted to ask for some clarification? For the frosting, the instructions read melt the 2 cups of butter with the tea but at the very last step, it’s specified “both kinds” of butter? thanks for the catch. it’s only one cup of infused tea butter. the other butter is just added at room temp. What is the drippy part? Couldn’t find a reference in the article or recipe. Thanks!! 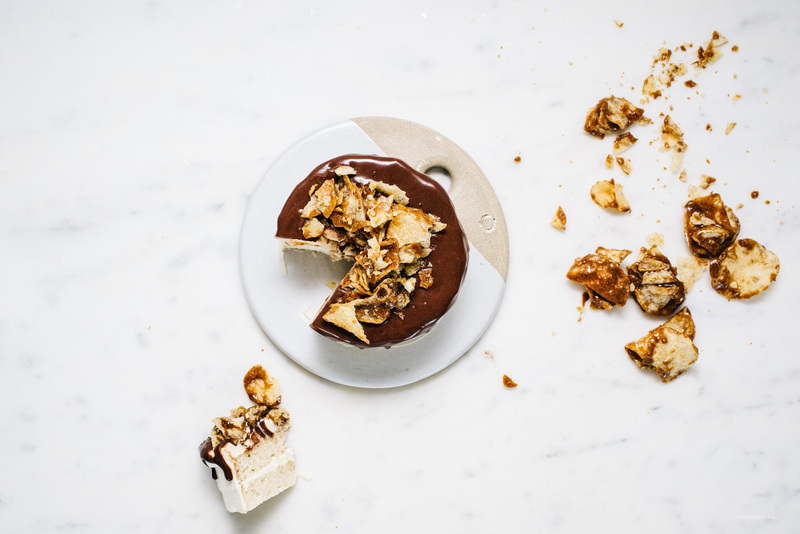 the drippy part is a simple chocolate ganache. i didn’t include it in the recipe because i found it kind of detracted from the london fog and caramelized chip flavor. This looks amazing and I am definitely keen on trying it out. However, I don’t have any 6″ cake pans, just your standard 9″ circular ones… could I use these? What sort of adjustments do you think would have to be made? Hoping you can help! I’ve made this cake TWICE now. 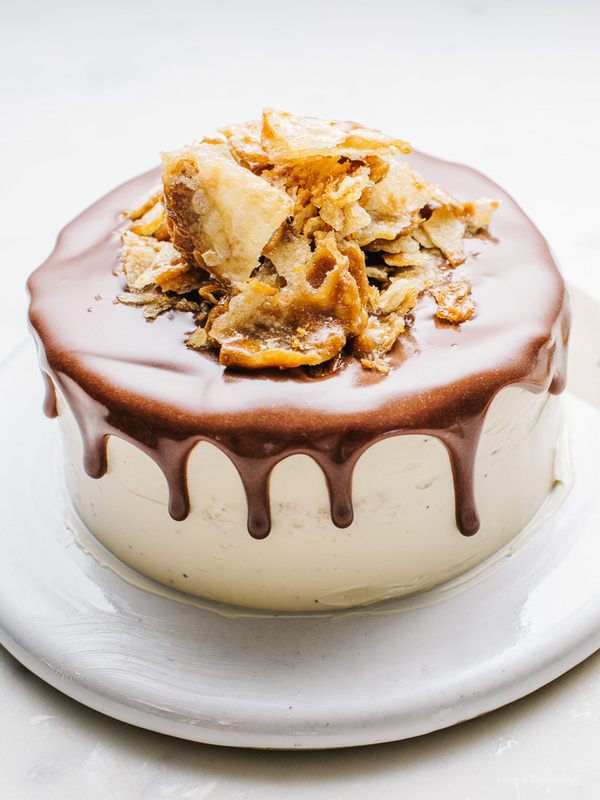 Once for the Gilmore Girls reunion because, hello, this cake with a cafe drink and some caramel junk food goodness just screams Rory and Lorelei. And now I’m just making it because it’s so delicious. 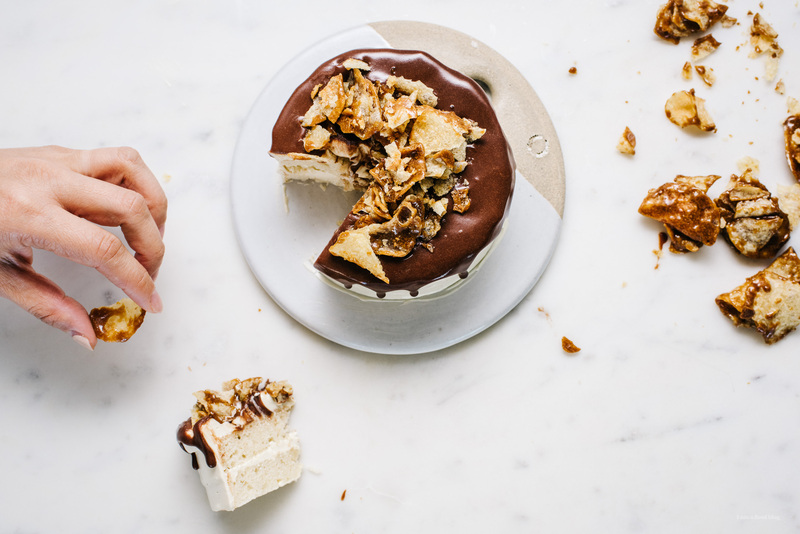 The chocolate drip on top seriously just makes this cake. 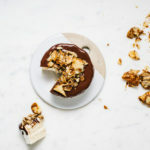 I used dark chocolate so it cuts back the sheer sweetness of the cake and frosting, although, let’s be honest, I would totally just eat a whole bowl of that frosting.